Blueberries are also known as the powerhouse of anti-oxidants. These sweet, small round blue-purple berries have the highest rank in the world for having an excellent amount of anti-oxidants.This is mainly due to presence of Anthocyanin, a pigment responsible for the blue color of the blue berries. Antioxidants strengthen your immune system by neutralizing free radicals. In addition, they also contain a good amount of many Vitamins (C, E, K, A and B complex), minerals and dietary fibers that contribute immensely for optimum health and wellness. Blueberry is very low in calories. 100 g fresh berries provide only 57 calories. Being low in calories, it is consider very helpful for weight loss purpose. Due to their delicious taste and several health benefits, blueberries are often used in various food recipes. 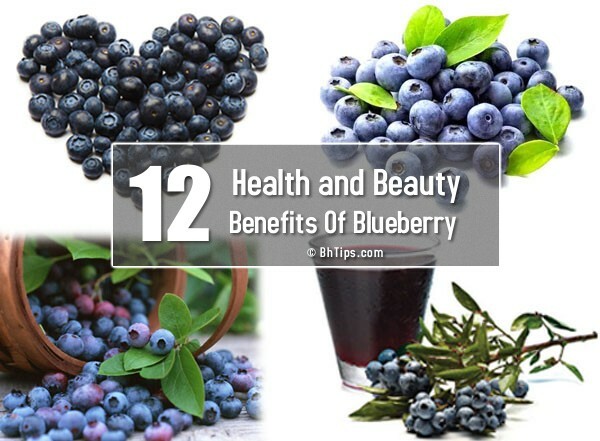 Let's have a look on best health, fitness and beauty benefits of blueberries. Blueberries contain a component called anthocyanosides which helps in preserving the vision even after we start to age and also prevents various eye diseases like cataract, myopia, macular degeneration etc. Data reported in a study published in the Archives of Ophthalmology indicates that eating three servings of the fruit per day may lower your risk of age-related macular degeneration (ARMD), the primary cause of vision loss in older adults, by 36 percent. A study published in the journal Free Radical Biology and Medicine suggests that blueberries improve memory and reverse age-related memory loss. Blueberries contains a rich amount of antioxidants called flavonoids, which have been found to activate the parts of the brain that control memory and learning. Several compounds in blueberries are known cancer fighters, such as resveratrol, flavanols, and anthocyanins. One impressive study found that the phytochemicals in blueberries worked together to stop the growth and spread of breast cancer. The results of a study published in 2010 in Carcinogenesis showed that pterostilbene, a compound in blueberries, may help protect against colon cancer.Laboratory studies published in the Journal of Agricultural and Food Chemistry show that phenolic compounds in blueberries can inhibit colon cancer cell proliferation. Blueberries are a good source of fiber that helps in reducing bad cholesterol in the body. Reducing the bad cholesterol improves our heart’s health.In addition, blueberries are rich in anti-oxidants that protect the blood vessels and certain blood components from oxygen damage and thereby preventing various heart related diseases such as stroke and heart attacks. Scientific Researchers have proved that blueberries when consumed by people with type 2 diabetes can help regulate the blood sugar level. In type 2 diabetes the blood sugar level of the patient is high as there is no proper production of insulin by the pancreas. In this case when they consume blueberries regularly, the blood glucose level of the patients gets reduced. Fiber contents in Blueberries prevent constipation. One cup of raw blueberries contains four grams of fiber, or over 15 percent of the recommended daily intake. The soluble fiber present in blueberries can absorb 10 to 15 times its own weight in water, drawing fluid into your gut and increasing bowel movements. Blueberries are high in manganese, which plays an important role in bone development. Polyphenols in blueberries may boost bone growth or even prevent osteoporosis. A study published in the Journal of Bone and Mineral Research in 2010 showed that animals fed rations that contained 10 percent freeze-dried blueberry powder had significantly more bone mass than those animals whose rations were blueberry-free.. According to the U.S. Highbush Blueberry Council, blueberries have more antioxidants than any other fresh fruits or vegetables. Antioxidants strengthen your immune system by neutralizing free radicals introduced into your body by exposure to smoke, toxins and pesticides. Most of the berry's antioxidant power comes from Anthocyanin, the pigment responsible for the blue color of the berries. If your immunity is strong, you won’t catch colds, fever, pox and all such nasty viral and bacterial communicable diseases. Blueberries contain dietary fibers and are low in calories that help to reduce belly fat. Several scientific researches have proved that blueberries stabilize sugar levels and avoid the unwanted accumulation of fat around your stomach. Blueberries contain a compounds that prevent bacteria from adhering to bladder walls, which helps ward off urinary-tract infections.The building of colonies of certain bacteria like b-coli along the lining of the inner walls of urinary tract is responsible for this infection, resulting in inflammation, burning sensation during in passage of urine and other complications.Blue Berries has a compound formed of big polymer like heavy molecules which inhibits the growth of such bacteria. It also has some anti biotic properties which adds to this effect. These heavy and big molecules almost wash-off these bacteria along the tract, thereby preventing the infection. Antioxidants present in blueberries protect the skin from free radical damage, thereby prevent premature wrinkles and stop early signs of aging and slow down the natural process of aging.